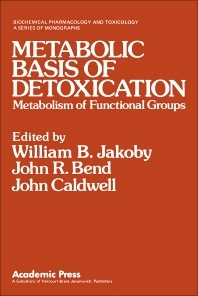 Metabolic Basis of Detoxication: Metabolism of Functional Groups considers the possible fates of the relatively circumscribed number of functional groups that xenobiotics bear. An understanding of the possible reactions, and the chemical and biological factors influencing them, will contribute to the overall predictability of the fate of "real" molecules. This approach attempts to knit together the understanding of metabolic pathways with that of the enzymes that catalyze the specific steps. The book contains 18 chapters and begins with a discussion of the biological oxidation of carbon atoms. This is followed by separate chapters on the metabolism of halogenated aliphatic hydrocarbons, aryl halides, heterocyclic rings, alcohols, aldehydes, and ketones. Subsequent chapters cover oxidative processes such as metabolic dealkylations and biological oxidation at nitrogen centers; the reduction of nitro and azo compounds and tertiary amine N-oxides; the oxidation, alkylation, acylation, and glycosylation of mercaptans; epoxide metabolism; and conjugation of phenols. The book aims to inform and interest the pharmacologist and toxicologist concerning the biochemical aspects and to orient the biochemist to the pharmacological insights required in dealing with the metabolism of xenobiotics.